Listed below are a selection of pub crawls that you may want to try out. They encompass the five different areas in Newcastle covered in the site. We have picked out nine pubs in each crawl which have a particular theme, character or atmosphere that should cater for all tastes. You may pass a number of other pubs or bars during the crawl which you could also try out, but we would strongly recommend you stick to those mentioned. 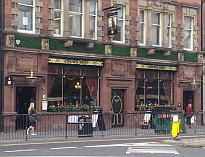 Click on any of the pubs highlighted to obtain further information and a picture of the pub. Starting from The Charles Grey by the Monument you exit and head down Grey Street. After the Theatre Royal turn first left along Shakespeare Street. Towards the end of the street on your right you will find Lady Greys. On leaving the bar, turn right and at the end of the street turn right again onto Pilgrim Street. Continue down Pilgrim Street, taking the first turning on your right down High Bridge. Along this street you will find the Bacchus. This pub has recently been rebuilt in a new position on High Bridge and always has an excellent atmosphere with an excellent range of real ales. 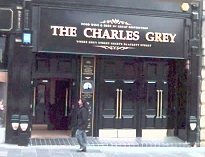 After sampling another drink leave the bar and carry on up the lane onto Grey Street, turning left at the bottom. Carry on down until you reach Fitzgeralds. As you leave the pub, cross the road, then continue down High Bridge and pop into The Duke of Wellington for a swift pint of real ale. This pub also serves an excellent pint and hosts beer festivals throughout the year. The next port of call is just around the corner. From outside the pub, turn right and go up some small steps and along the rear alley and The Old George beckons. After leaving the pub, turn right and head to the main street. Turn left and head on down to the bottom of the street where you will find Balmbras, a famous old historical pub on the left. As a former music hall, it was here the song "The Blaydon Races" was first performed. Unfortunately the bar is currently closed but there are plans to re-open again in the future. So head across the road past the Job Centre and turn right up the street. The Blackie Boy is on the left hand side. On exiting, continue on up to the top of the Bigg Market, where you will find Idols Vaults. This is the end of the crawl and by now you should have had a good time and sunk a few beers into the bargain. You start at the Goose on Percy Street, under the Eldon Garden Shopping Centre. When you leave, turn left and head along the road and keep going until you reach The Hotspur directly opposite the bus station. From here as you exit, turn left and continue on up the same road. You will eventually arrive at Crows Nest a large student bar. As you leave here, turn left again and cross at the traffic lights. Bear right past the church and continue down St Mary's Place. As you do so, you will be passing the side of the Civic Centre. You will eventually come to a junction with traffic lights, cross here and you will see The Five Swans directly opposite. When you leave the pub, take the exit that has the tables outside. Turn right, continue down and take the second main street on the right. You should now be on Northumberland Road. Walk down the road and on the right you will see the Pacific House, one of the busiest bars in town. On leaving, a little further down the road you will come to City Tavern who serve their own City Tavern Ale. Turn right as you leave and then left at the end of the street. You will now be walking down Northumberland Street - a main shopping area. As you near the bottom of the street you will need to turn left by the Suit Company. Walk up the lane towards the City Library. At the top, turn left and you will find Trillians Rock bar. From here, as you come out veer right, go down some steps and at the bottom turn right and head towards Grey's Monument. You will cross over a set of traffic lights on your way. By the Metro station at the monument you will see The Charles Grey. This is your last port of call, where you can wind down and finish off with one final drink. Hope you enjoyed a good night.